Hiya guys! I feel like I am falling apart! If it's not one thing, it's another and now my back is 'out'. I'm having difficulty walking and such, but positive side is I can sit without being in any more pain. Sitting = swatching, haha. It's a grim positive, but I have got to find a bright side to everything or else I'll go insane. But anyway moving on, in today's post I'll be sharing swatches for the Rainbow Reboot Collection by Dam Nail Polish. This indie is known for their beautiful thermals so get ready to pick up your jaws because these will have you drooling! Warning: this is a very photo heavy post ahead, but trust me it's worth it with these gorgeous thermals. The Rainbow Reboot Collection by Dam Nail Polish will be released next Friday, September 25th. The polishes are already available for pre-sale in both a full collection and individually. Preorders run until the end of the day on 9/24, and are scheduled to ship on 9/28. Teal Next Time can be described as a light blue when warm that transitions to a turquoise blue when cold. Starting off with one of my favorite transitions in the collection. This one is so lucid and flawless, I ended up wearing it for a few days after swatching it. The formula had a bit of a patchy application, but it ended up evening out well with a third coat. Shown here in three coats and sealed with a glossy topcoat. Citrus Sherbert can be described as a tangy yellow when warm that transitions to a peachy orange when cold. I think the name fits this polish so perfectly, especially when it's mid-transition. The formula was great throughout and didn't give me any issues layering. I actually found it to be surprisingly opaque considering it's one of the lighter shades here. Shown here in two coats and sealed with a glossy topcoat. Iris of the Beholder can be described as a light lilac when warm that transitions to a fuchsia when cold. Based on just transition alone, this is hands down my favorite! Gorgeous color shift, I have to say it's a must-have guys. Easy and smooth formula throughout. Shown here in two coats and sealed with a glossy topcoat. This Magic Mo-mint can be described as a light mint green when warm that transitions to a lime green when cold. Another one of my favorites and a definite must-have (especially if you like green). Love the dramatic effect of the transition with this one. Excellent formula and consistency, not too thick or too thin. It applied in a cold state for me and felt very opaque in a single coat. Shown here in two coats and sealed with a glossy topcoat. Pinky Promise can be described as a light pink when warm that transitions to a medium pink when cold. 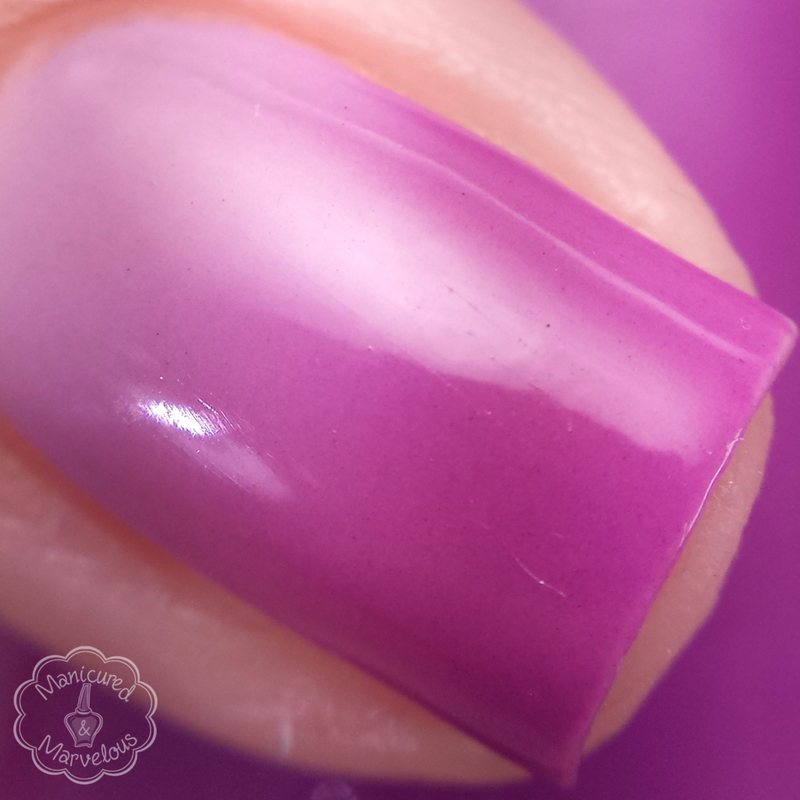 Such a pretty shade in both states, it's the all-around girly Barbie shade. Again with this one you'll find the same consistent formula and application. The colors transition flawlessly without any issues. Shown here in two coats and sealed with a glossy topcoat. Overall as a huge fan of thermals, I am absolutely in love with this collection. 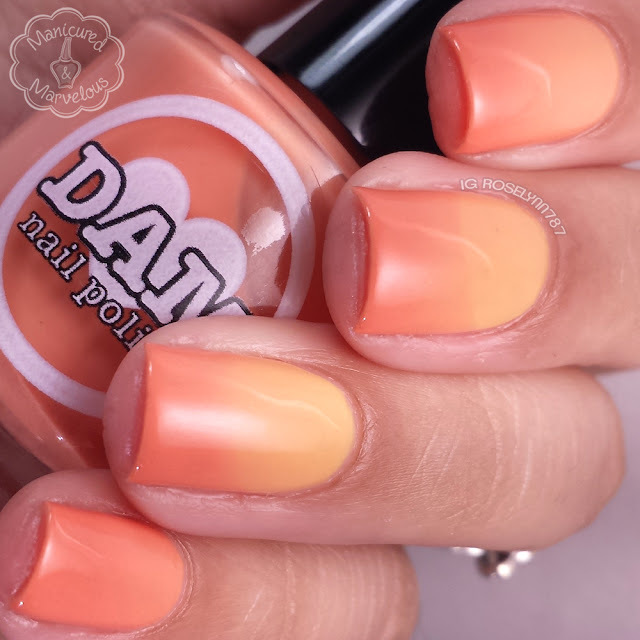 I'm talking head over heels, gushing left and right in love with these polishes. If it sounds like I am gushing, it's because I truly am over this collection. Everything from the formula to the color transition hit the mark head on. If you've ever been on the fence about thermals before, I feel like this is the set that will make you have a change of heart. 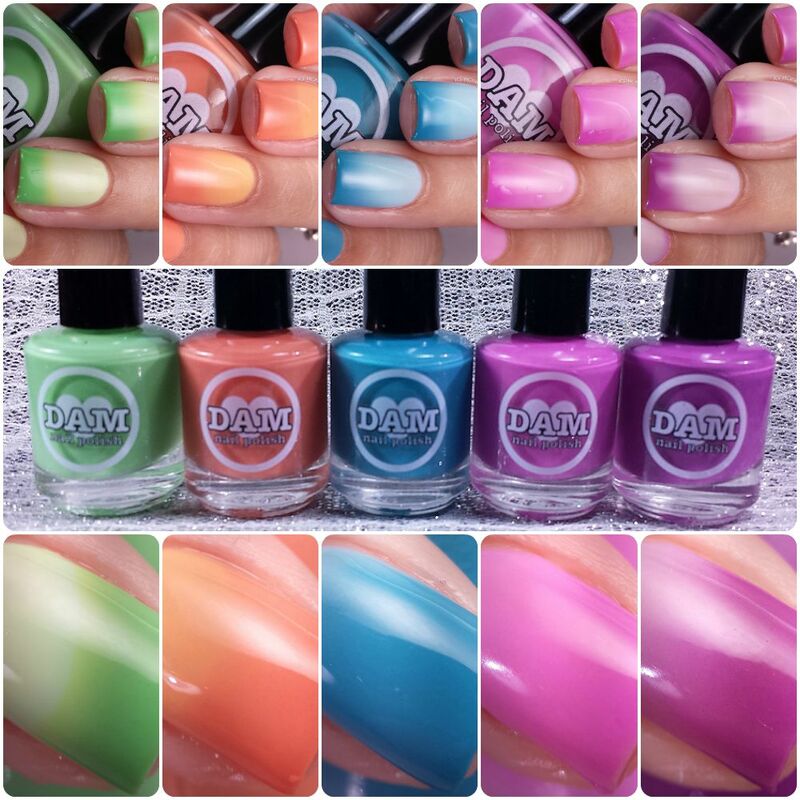 As I mentioned before, the Rainbow Reboot Collection by Dam Nail Polish will be released this Friday, September 25th. The polishes are already available for pre-sale in both a full collection and individually. Preorders run until the end of the day on 9/24, and are scheduled to ship on 9/28. So sorry your back is paining you. That's the worst. The swatches are gorg as usual. 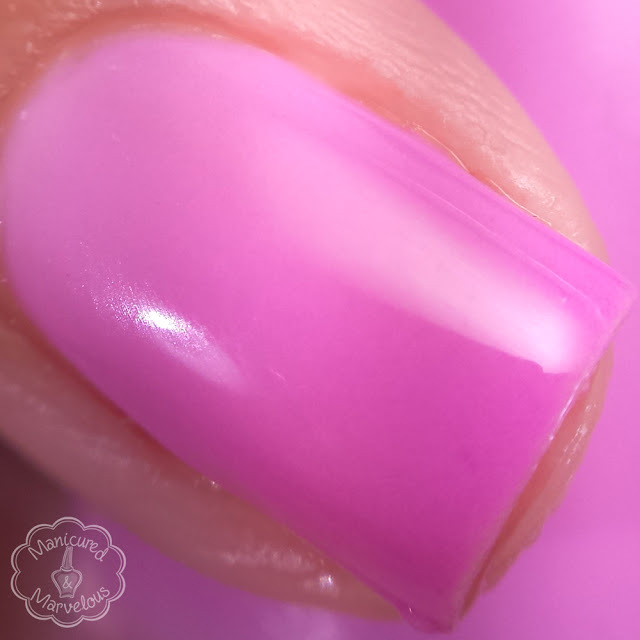 I love a good thermal polish! Pinky Promise is so gorgeous! Your swatches are always on point. These are insanely gorgeous! Sorry you're having such a rough time. These are stunning! Fab swatches as always! Hope you feel better soon! I've never heard of this brand, but I am very interested. Feel better soon! I love Iris! Gorgeous swatches! These are some beautiful creme thermals! Glad to hear you're well enough to polish! This collection is beautiful and the transition is amazing in every single one of them! Sorry to hear about your back! I was in a car accident and get back spasms that sometimes have me in a states where I just have to be on bed rest. So it's not fun! Hope you feel better ASAP! 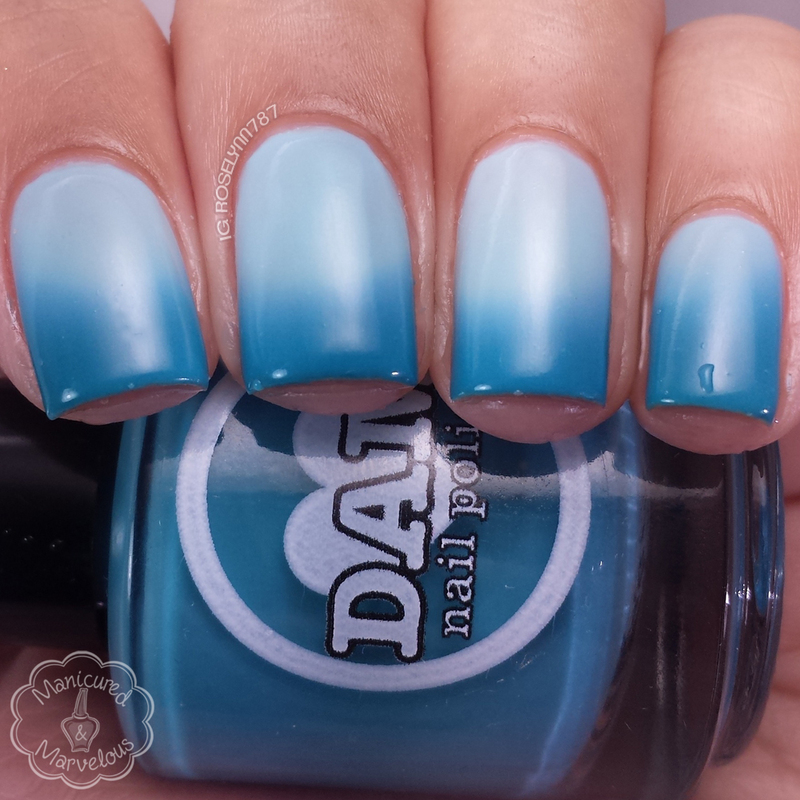 These thermals are beautiful and your swatches are always stunning! I'm really sorry to hear about your back. I've had chronic neck pain for over a month now so I can definitely relate. What gorgeous thermals though!! This Magic Mo-mint HAS to be my favorite if I had to choose. I LOVE thermals that transition to 3 colors instead of 2!